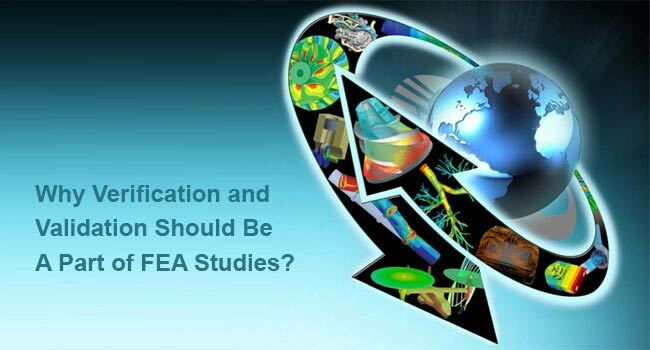 » FEA Knowledgebase » Why Verification and Validation Should Be A Part of FEA Studies? Why Verification and Validation Should Be A Part of FEA Studies? Finite element analysis is a numerical approach to evaluate solid mechanics problems. Today, most engineers utilize this approach as a means to assess the product design performance. FEA however requires creating a mathematical model from the CAD model by defining the geometry, loads and constraints along with the type of analysis required to be performed such as structural or thermal. During this conversion process of a CAD model to mathematical one, many assumptions are being made for simplifications, which give rise to the chances of errors in the results. As such it is crucial for engineers to verify the accuracy of the FEA solver and also validate the results against experimental tests, in order to ensure an error-free finalized design. A mathematical model requires discretization into number of finite elements, which is termed as meshing. The process of meshing is used to convert the mathematical model consisting information about loads, geometry and other constraints into an FE model. However, improper selection of meshing elements or mesh size leads to errors in the solution, which are also known as discretization errors. The prime requirement in this case is to select the elements that are capable enough to capture the stress and deformation values accurately. The quality of results depends largely on the how well the elements are used for the specific problem. One the FE model is created, the solution process is initiated, which in itself involves solving large number of linear equations, introducing numerical errors at each step. While most of the errors can be neglected, there are errors due to approximations that can lead to FEA malpractices. Hence, it is always better to verify the models and validate FEA results against experimental tests. Verification is a process of determining the accuracy of the mathematical model submitted for solution with FEA. The model verification can fail if meshing is incorrect. For instance, if the meshing is too coarse to capture the pattern, the model will yield incorrect results. Different stress values are obtained depending on the mesh quality. This occurs commonly in critical regions of a product design such as edges, corners or joints, where coarse mesh is not able to capture the physics properly compared to refined mesh. Validation on the other hand is used to determine how close the FEA results are to the actual reality. To ensure that the FE solution accurately predicts the actual physical behavior of the product, it is required to perform experimental tests. This requires an FE solution to provide proper data to run experimental validations. Errors in the FEA results could be due to both verification and validation; however, the FEA solver cannot be considered at a fault in any case. The reasons for errors are usually due to improper understanding of the mathematical models and lack of fundamental FEA assumptions. To develop an error free FE solution, a proper training is essential. As such, the use of verification and validation process in the finite element studies can help improve the solution results and obtain know-how on possible sources of errors that can be eliminated or used as differentiator against experimental tests.